With its new big-bore V4 engine, comfy riding position and handling tweaks, the 2015 Tuono V4 1100 RR is nothing short of sensational. It sums up what a super naked should be: the ultimate in sportsbike performance, all wrapped-up in a usable, practical road package. Power, torque, handling, braking, electronics and comfort are second to none. There are no big changes, chassis-wise, but the old Tuono was always agile, stable and confidence-inspiring when ridden hard. You still get a Brunel-like aluminium frame and swingarm, fully adjustable Sachs suspension (or Ohlins on the new Factory), Brembo radial brakes and fat, sticky tyres. To handle the extra power and torque and Aprilia’s chassis gurus have fitted a 4mm longer swingarm for stability and reduced the trail to keep the agility. The engine is fixed lower in the frame, for a lower centre of gravity and it has gripper new Brembo brake pads. Now it takes even less effort to point the Tuono where you need it, even at high speed, over lumps and bumps in the road. You can ride the Aprilia with your fingertips and it responds to the gentlest of inputs from the rider, all the time giving you feel and confidence. It’s impossible to get to the limit of what the new Tuono V4 1100 RR is capable of on the road. You have so much in reserve through the corners that you’d need to take it on a track to really see what it can do and even then you’d come away thinking the Aprilia is better than you are. 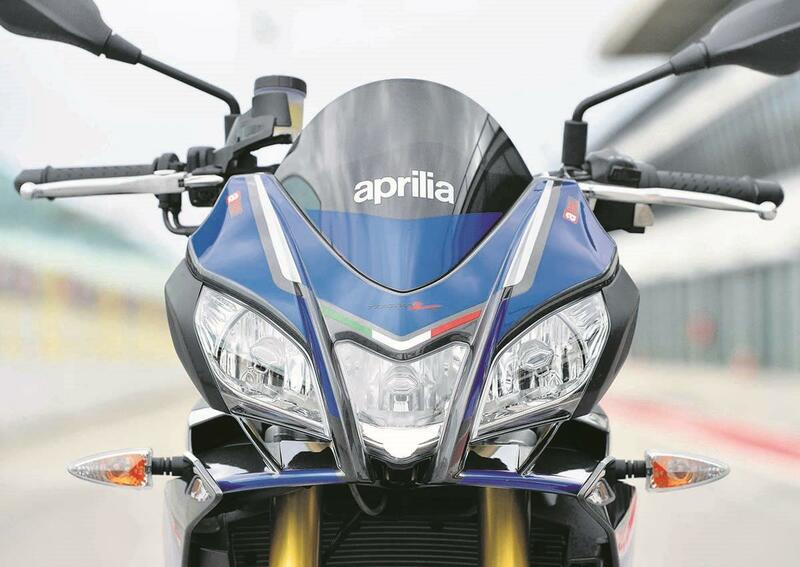 The Aprilia is comfier, thanks to its softer new seat and narrower bars. Although footpegs are rear-set like a race bike, there’s still plenty of legroom and the new bar position and fairing gives head, shoulders and neck an easier time of it, too. More refined electronics now ensure that in all three electronic riding modes the throttle response is clean and well-damped. As well as being fast, safe, comfy and a cornering genius, the new Tuono V4 1100 R is still a thing of beauty and quality. It will be as rewarding spending time with it in your garage cleaning it and marvelling over the build quality as it is pulling great big wheelies and skidding into corners (with the ABS switched off). The Aprilia is the next most expensive Super Naked, after the KTM 1290 Super Duke R, but you see where your money goes. It’s the ultimate super naked in terms of performance, electronics and spec. You get a stonking superbike engine, chassis and electronics package, Brembos, fully-adjustable suspension and quality machined and aluminium cycle parts. There’s the usual array of optional performance and touring accessories available, too, including the new Aprilia ‘V4-MP’ datalogger, also available for the new RSV4, which gives you real-time telemetry via a smartphone/tablet app. 2003: V-twin Tuono 1000 Fighter and Racing launched. 2005: Tuono version of the new-style RSV1000 released. Factory version also available. 2011: Tuono V4R launched, based on V4 RSV4R. Two versions available, one with or without APRC electronic rider aid package. 2012: APRC version only available. 2015: Tuono V4 1100 RR launched. Based on V4R, with a bigger engine, more power and torque, refined electronics, tweaked geometry, a 4mm longer swingarm, a comfier riding position with a softer seat, narrower bars and a more aerodynamic fairing. 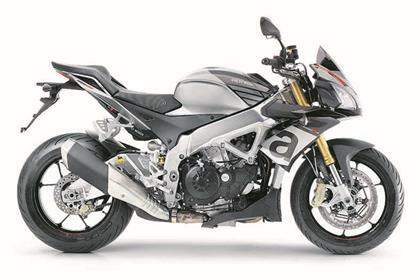 A Factory version is available for the first time since the old V-twin Tuono, with Ohlins suspension and steering damper. Tuono V4 1100 Factory – Comes with fully-adjustable Ohlins forks, shock and steering damper. Costs £1500 extra. 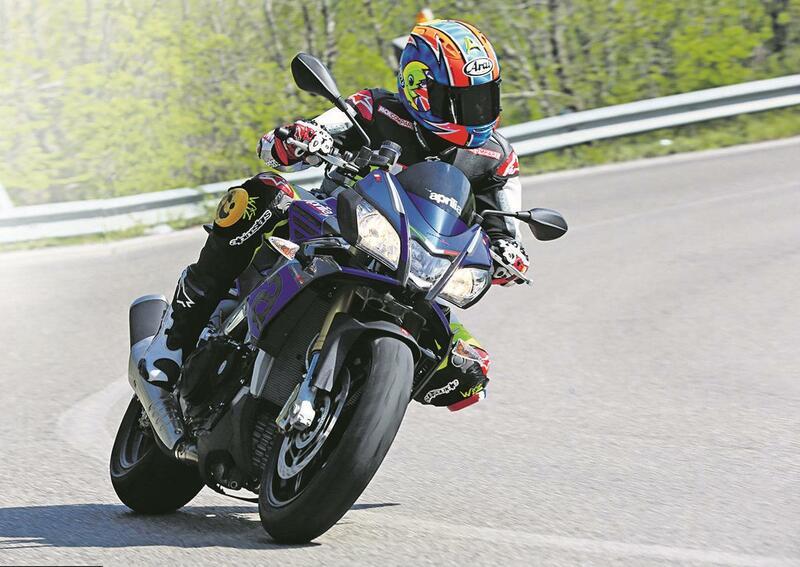 2 owners have reviewed their APRILIA TUONO V4 1100 RR (2015-on) and rated it in a number of areas. Read what they have to say and what they like and dislike about the bike below. I have tried everything in the naked class, Ducati Monster R, BMW, Yamaha MT 10, Suzuki GSX-S 1000, Kawasaki's naked 1000 blank of wood thing, nothing comes close to this bike. Bike is always at its best, not built for a pillion, who wants a pillion on a bike like this I will have the rear pegs removed at its first service. V4 howl is incredible, nothing else like it on the market, already ordered an Akrapovic exhaust to be fitted at first service which apparently makes it sound even better! Best build quality seen so far. Best components, best tyres, only niggle is that the wheels are not forged. Got a really good deal from my local dealer, traded in a year old Suzuki GSX-S 1000 because it was/had depreciated so much. This is a great bike. It accelerates and decelerates literally as fast as you want on the road and handles effortlessly around corners. It looks great and the engine sounds amazing without being ridiculously loud. It also works well for commuting, it is easy to move around at low speed and filters very well for a larger bike. It does not feel as heavy as it is and is very well balanced. If you only want to own one bike it is the best compromise I have found between performance, sound, looks and suitability for commuting. The ride quality is great and the brakes work fine. The engine braking is adjustable with the engine maps. At low speeds (less than about 40km) the engine braking can be a bit severe around corners but when you take it touring you understand why because it is perfect at speeds above that. The seat is much improved from the last model. I still get a sore backside after a couple of hours but I get that with most bikes as I have no natural padding. On the freeway it gets pretty windy above 110km but you can duck down behind the windshield for a bit of protection. It provides more wind protection than any other (semi) naked bike I have ridden and I guess less wind protection is always the compromise for the increased comfort of higher bars. The engine gets very hot in slow traffic and a lot of heat gets passed onto your ankles. I don't think you could ride this bike in traffic wearing shorts and sneakers (although I have never tried it). The pegs are high for a naked bike which is good for cornering and does not affect comfort. It is quite a tall bike but not uncomfortably so for me (I am 5'10''). The engine is amazing. It gives the low end torque of a v-twin and also the high end acceleration of an inline 4. The sound with the stock pipes is great at all rev levels. There is none of that high pitched whistle that you get with inline fours or triples and far less of the lumpy feel that you get with v-twins at low revs. You can adjust the settings to scare yourself as much or as little as you want. No problems with quality or reliability so far. It is well put together, much better quality than the Ducati I had previously, which to be fair was a much less expensive bike. It is not quite as well engineered as some Japanese bikes I have owned (no fuel gauge, have to look down from road to see mirrors and speed), but it more than makes up for it in character and exhilaration level. The running costs are about average for an engine this size, although it is a new bike so too early to say really. It uses a lot of fuel in heavy traffic situations (150km per tank) but much less than that touring (250-300km per tank). My favourite feature is the quick shift. It works above 4000 revs on the upshift and really speeds up acceleration. It sounds great even just accelerating up to the speed limit in suburban situations. I also like the display, it is easy to read and has a lot of information (gear, engine temperature, clock, traction control level, etc). The interface to change all the settings is not intuitive but once you get used to it you can use it quite easily. The traction control and engine maps are easy to adjust. The ABS and wheelie control are more complicated. It has stickers saying #be a racer on the tail which I think are a bit nerdy, but you can take them off. The gearing is not too tall but I am about to try a front sprocket with one less tooth as I hardly use the top gear and want to see if it improves low speed performance even more.